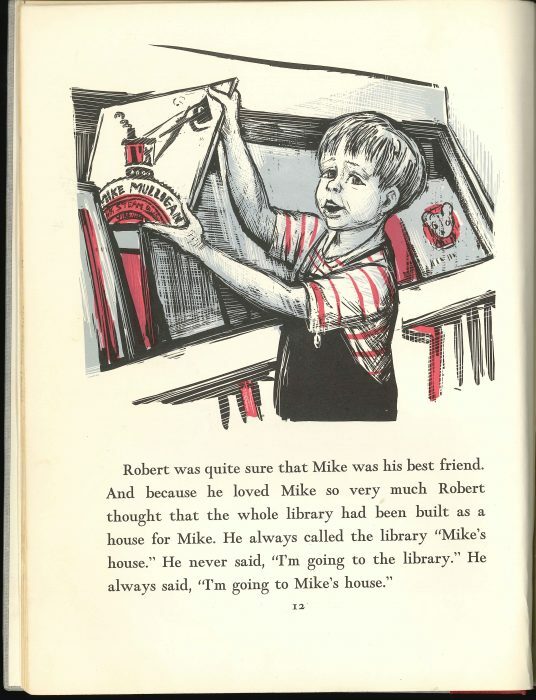 This is a page from Julia Sauer’s Mike’s House, published fifteen years after Virginia Lee Burton’s Mike Mulligan and His Steam Shovel and fourteen years before Ramona Quimby asked how Mike Mulligan goes to the bathroom while he is digging the cellar for the town hall. I ran across Mike’s House at the university library– I liked Sauer’s Fog Magic as a kid and wanted to check out The Light at Tern Rock. You know what else has longevity? Don’t Stop Believin’. This Boomwhacker version has been in my head for days since I ran across it at TYWKIWDBI. I watched it all the way through on a difficult news day and felt better, that people do stuff like this, work on it until they can do it off book in one take. 1. What’s a good movie for October that has nothing to do with monsters or Halloween? After Life (1998), a Japanese movie that’s contemplative and quirky in just the way I like. 2. What’s a good couple of songs for October that have nothing to do with monsters or Halloween? Wynton Marsalis and Sarah Vaughan doing Autumn Leaves together. Cat Stevens’ Moonshadow. 3. What are some reasons to love October? Monsters and Halloween, of course! Also fresh apple cider. Chilly mornings so I don’t get to work all sweaty if I walk. Sunshine with golden leaves and deep blue sky. 4. Radio stations sometimes call this month Rocktober, doing special playlists or giveaways in celebration of rock music. What would be a better rhyming name for this month, and how might it be celebrated? We have local Walktober promotions. But I’ll go with Socktober, because having enough cozy warm socks without holes is a great feeling. 5. What would be a good holiday to establish in October for those U.S. states not commemorating Columbus Day? Portland celebrates Indigenous Peoples’ Day on that Monday; I’m good with that. After I read Rahul Kanakia’s hilarious and unswerving YA novel Enter TItle Here, I started reading his blog. I’ve read this post three times: Some Advice to Writers on How to Search for the Heart of Longing. I like the connection he makes between a mundane-ish life and what makes you feel yearning and engagement as a reader. I also like its thinking-out-loud feel. Lynda Barry has been linking to videos of the PS 22 Chorus on her class Tumblr. This morning’s was Coldplay’s Viva la Vida. I love how freely the kids sing and move. I would like to sing like that more. Neeble neeble neeble, neeble neeble— neeble neeble neeble neeble!! I replaced my damaged Scarlatti keyboard sonatas CD with one by Dubravka Tomsic. I’ve always liked listening to Scarlatti while I work– I remember a happy snowy morning of geometry homework and Scarlatti when we were doing compass and straight-edge. Yes, trisecting an angle for fame and fortune, I will get right on that! And Scarlatti is in the subset of my writing music that Sanguinity can tolerate when we’re at home writing together. (Russian men’s chorus, no. Enya’s Shepherd Moon definitely no, although it always works because I wrote my whole thesis to it. Cristina Branco yes.) Anyway, I think this version and I will become friends just fine. Many of our tomatoes were volunteers this year, but they made it and the orange cherry-sized ones are especially nice. Some split skins because of the sudden rains. Sanguinity took me for pho last night and the restaurant’s TV was showing the Emmys. I hadn’t seen any of the comedies. Remember when the best TV was sit-coms and the Friends cast made more money than any actors ever? When I stayed at a hotel alone this summer and channel-surfed before going to sleep, none of the reruns I clicked through held up to the test of time except Frasier. That surprised me, because I got pretty sick of Frasier when it was being broadcast. I’m supposed to go to a strike captains’ training tomorrow because my union may go on strike Monday. But even though the union’s good about providing food, I am a very hard sell for meetings that last over an hour. No way 5:30 to 8:30 is going to work for me. Coincidence or unwritten rule? It does have a nice anticipatory tone for a lead-in. Text sent to sanguinity at 4:50 p.m. yesterday: “Coming home a little early– yay! Because my back hurts– booo!” I was quite gleeful at having caught an early bus despite the tweaky back. In reading news, I started Code Name Verity and could tell right away it’s as good as everyone’s been saying. And I finished Kage Baker’s The Sons of Heaven, which I consider the last of the novels as far as The Company series goes. I know there’s a prequel about Edward, and some short-story collections and novellas I plan to read, but it will all be filling-in. The Sons of Heaven was a gossipy and satisfying drawing together of threads, and that carried me through the Big Battle At The End (I’m not a fan of those usually, especially in fantasy novels) and the difficulty of nearly-omnipotent characters and how to make them interesting. This afternoon I put on the season’s first Christmas music and my very favorite holiday album, 1987’s A Very Special Christmas. It’s a benefit compilation for the Special Olympics and has Bruce Springsteen’s “Merry Christmas Baby,” Alison Moyet’s “The Coventry Carol,” and Stevie Nicks’ “Silent Night.” (“Whoever that is, I’m scared,” sanguinity said.) I was so psyched I did ALL the dishes on the counters, and there were a lot of them.